Satyanarayan Puja is performed to seek the blessings of Lord Vishnu and to maintain the happiness, success and well-being of the family. Satya Narayan is the form of Lord Vishnu and the Lord in this form is considered a personification of truth (Satya). Prayers and Pujas are held at home with family and friends by reciting the incredible story of Lord Satyanarayan. According to legend, the great sage Narada explained to Lord Vishnu regarding this Puja, which is held on the day of Poornima (full moon day) for being blessed with success and prosperity. To reminisce about the stories of the day, the children in the family are asked to take turns in reading out particular chapters from the Holy book. 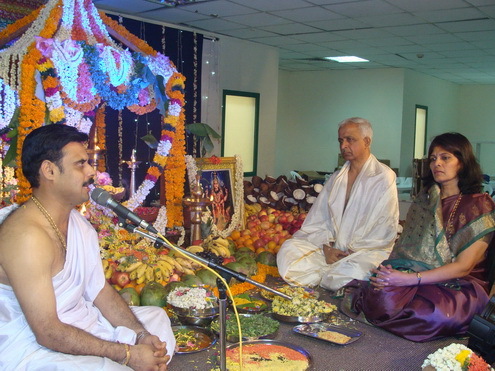 If you are organizing a big puja for the day, it is best to send out online invitations via Yoovite. With online invitations tools like this, you will be able to get all your invitations done quickly as well as receive a response from your invitees immediately. They can let you know if they are attending the Puja through the easy RSVP option available on the site. 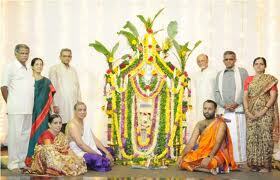 The Satyanarayan Puja is usually held at home and devotes decorate homes with flowers and small decorations. The whole house is cleaned and all the members attending the Puja wear new clean clothes and place their offerings on the altar. Handmade flower garlands are used to decorate the deities and colored pictures of Lord Vishnu that are placed in the altar, where the Puja is to be held. Ornate decoration is also used for the altar. The devotees follow a vegetarian menu for the day. Different kinds of fruits like oranges, grapes and Indian vegetarian curries with rice are served on this day. The participants of the Puja place food as offerings on the altar and then the same food is distributed in a community feast. According to the Hindu beliefs, when a puja is conducted, puja invitation cards are sent to all relatives, friends and families residing nearby. When you are using an invitation website like Yoovite you can also choose the online invitation card designs.